The design of experiments (DOE) development group at JMP has been busy working on the upcoming version of the software, so I cannot mention every new thing in one short blog post. Here, I will cover a few important new features. Speaking of covering, the most exciting new feature supports a completely different kind of design – covering arrays. What is a covering array, and who needs them? Many complex systems have very little random variability. That is, once the controls are set, the system performs the same way all the time. Examples are electronic components and software programs that do not deliberately use random numbers to create variability. Testing such systems is important to both manufacturers and consumers to make sure that all the intended behavior of the system, regardless of the control settings, is correct. Now imagine a system that has 20 switches that control various system behaviors. The designer of the system would like to demonstrate that the system works as desired no matter how the switches are set. However, to test all possible combinations of the 20 switches would require more than a million trials. This could be prohibitively expensive both in time and money. It turns out that usually an unanticipated combination of only two or three controls leads to undesirable behavior. So, if you can build a test plan where every pair (or triple) of settings is explored, then you will have covered every two-way (or three-way) combination. A strength 2 covering array guarantees that you will test all four combinations of any pair of switches. A covering array of strength 3 ensures that all eight combinations of any triple of switches is tested. Since system testing is often time-consuming and unproductive, covering arrays with a minimum number of trials are most desirable. Surprisingly, using JMP 12, you can test all two-way combinations of 20 switches with only eight trials -- provably the smallest possible number. To test all three-way combinations requires only 18 trials. So far, no one has published a covering array for this case with fewer runs. Clearly, using a minimum size covering array can save lots of time. The covering array tool in JMP 12 supports any number of factors with any number of levels up to strength 6. You can also specify multiple infeasible combinations of factors and the resulting covering array will avoid those combinations. Have you added any features to definitive screening designs? 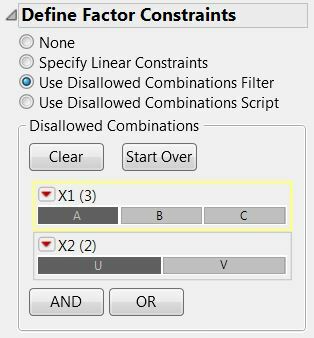 Definitive screening designs in JMP 12 now support orthogonal blocking in a way that is much more flexible than blocking standard textbook designs. For standard two-level fractional factorial designs, the number of blocks must be a power of two (i.e., 2, 4, 8, 16, etc.). Also the number of runs in each block (excluding center runs) must also be a power of two. By contrast, you can build an orthogonally blocked definitive screening design where the number of blocks can be any integer between 2 and the number of factors. So, if you want to run an experiment from Monday to Friday and you want to block on the factor Day, you can create a definitive screening design with five blocks. Anything new in space filling designs? There are two important new capabilities for space filling design. First, you can now add a categorical factor to a space filling design. The resulting design is space filling for each level of the categorical factor and is also space filling ignoring the categorical factor. Second, a new feature of the Augment designer in JMP 12 supports space filling augmentation. The augmented points are spatially separated from the original points to more fully explore the specified region of the factors. A couple of years ago, one of the talks at the JMP Discovery Summit conference dealt with various clever ways to specify infeasible factor setting using linear inequality constraints. Sitting in the audience, I realized that the red triangle menu item in the Custom Designer labeled Disallowed Combinations was too inaccessible to most users. Advanced users knew about Disallowed Combinations but complained that writing a Boolean expression defining all the infeasible settings was difficult and prone to error. Disallowed Combinations wizard is based on the Data Filter interface. The image above shows the new Disallowed Combinations Filter being used to specify that level A of X1 cannot be set along with level U of X2. This capability is available in JMP 12 for the Custom Designer, the Augment Designer, the Space Filling Designer and finally for Covering Arrays. Though my example above shows two categorical factors, you can also use the filter with continuous factors. Editor's note: This post is part of a series of previews of JMP 12 written by the people who develop the software.